We’d love your help. 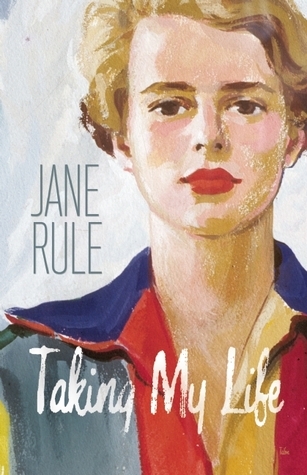 Let us know what’s wrong with this preview of Taking My Life by Jane Rule. To ask other readers questions about Taking My Life, please sign up. Writing an autobiography may be a positive way of taking my own life. … I may be able to learn to value my life as something other than the hard and threateningly pointless journey it has often seemed. … No plan for a story or novel can rouse my imagination, which resolutely sleeps, feeding on the fat of summer. And so, I take my life, with moral and aesthetic misgivings, simply because there is nothing else to do. omg gimme more! I wish this didn't end at 21 and covered her whole life, and also that every lesbian novelist would write an autobiography. I only read this bc it was available on the public library app to read on my phone, and I'm so glad I saw it. While it was interesting to learn about the early part of Rule's life, there's a reason she didn't offer up the book for publishing while she was alive. A writer needs to *finish* writing the story before the publisher get to make money off it. Rule was born on March 28, 1931, in Plainfield, New Jersey, and raised in the Midwest and California. She earned a bachelor’s degree in English from Mills College in 1952. In 1954 she joined the faculty of Jane Vance Rule was a Canadian writer of lesbian-themed novels and non-fiction. American by birth and Canadian by choice, Rule's pioneering work as a writer and activist reached across borders.